As this is largely based on the tongue in cheek ending of the original, how does Back to the Future II compare to its predecessor? Marty McFly travels forward thirty years to save his own family from disastrous events. When a future version of bully Biff meddles with the Delorean, McFly and inventor, Doc Brown, have a lot more to deal with than they anticipated. After the first film which never managed to glimpse any future after 1985, we finally see what life would be like in 2015. Although ambitious in its predictions, it’s amusing to see dog leads which walk dogs, automatic shoe laces and hover-boards. These future technologies are constantly playing background roles and continue to entertain although they age the film more than the original due to most of them now appearing more fun and tacky than sophisticated and practical for 2015. As with the previous film, a lot of the characters get to play alternate versions of themselves and relatives. Noticeably, Michael J. Fox, gets his first chance in the series playing Marty McFly’s son. Fox is great here, clearly defining the character by clumsy movements and a half broken voice. Thomas F. Wilson, who plays Biff and his grandson Griff, also acts convincingly in five different character portrayals and does a perfect job throughout of playing the simple villain of the story. Back to the Future II returns to old territory by revisiting 1955 to solve a problem that confusingly starts in the future. Luckily, this whole section is executed with style – writer/director Bob Gale and Robert Zemeckis cleverly intertwine three separate timeline characters and even keep the story astonishingly clear for the audience to follow. This is aided by Doc Brown’s constant explanations, once even on a chalkboard, and due to his loveable and mad persona, it never becomes patronising. Despite the return to 1955 being successfully achieved, it is disappointing for the story to rely so heavily on scenes from the previous movie. Basing a story around time travel leaves the possibilities wide open so this year of familiarity seems a short cut when the audience would surely have embraced another time zone with open arms. 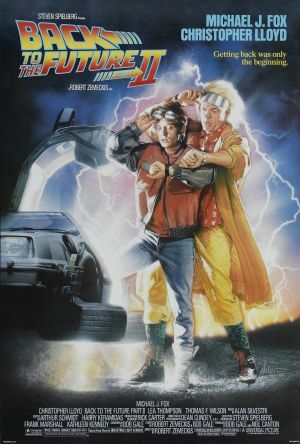 Back to the Future II is a fun, action packed and clever follow up to its smash-hit big brother, but due to a return to old subject matter this never feels like a significant step forward.